Vintage Leaf Memories - Michael Langlois: The 5 most fan-popular Maple Leafs in my lifetime—and the most revered. And...who do you think is the most popular Leaf now? The 5 most fan-popular Maple Leafs in my lifetime—and the most revered. And...who do you think is the most popular Leaf now? Every fan, or at least just about every fan, has their “favourites”. Not just their favourite sports, or teams that they have a preferred—or in some cases quite passionate—rooting interest in. They also quite often have a personal individual favourite, usually on the team they care about most. While some fans may root for a fairly obscure guy that is not a household name, or someone that is well-known but is more of a “lesser-light” in terms of production or fan and media attention, when enough of a team’s faithful like the same player, that individual can become awfully popular in a hurry—and sometimes for a long, long time. When I think back over the time that I have been following the Maple Leafs (and that goes back to the late 1950s) I can immediately think of a dozen or so players who really warmed the hearts of Leaf supporters everywhere. It was sometimes because of their goal-scoring ability, but just as often it was due to the type of player they were—and the kind of effort they gave just about every night. There is no question that the ability to bring you out of your seat, either at home or in the building itself, can help. But that is usually only part of the equation. We also like our players to have an un-wavering work ethic, and to be willing to take one for the team, as it were. So for me, when I look back and try to determine, albeit very un-scientifically, who were the most popular Leafs in my lifetime of cheering for the blue and white, it’s not easy to break it down to only the “top 5”. There have been so many Leafs who have inspired deep and abiding support. I’m not sure there has ever been a, say, 24-month window of time when a player was more beloved in Toronto than Doug Gilmour. Truth is, half of Leaf world probably barely knew who he was before Cliff Fletcher traded for him in the early 1990s. That was the case, even though the little center was a brilliant junior player in Cornwall and played so well for the St. Louis Blues before later winning a Cup with the Calgary Flames in 1989. The first time I really took serious notice of him was a mid-'80s playoff game (not against the Leafs), when he had something like 5 assists for St. Louis and was the best player on the ice. I kept thinking—whoever this guy is, he sure sees the ice well. We all know that the two wonderful springtime Leaf “runs” under Pat Burns in 1993 and ’94 came up a bit short, but it’s hard to imagine one individual working harder than Gilmour did in those years. Bobby Clarke may be the only guy I’ve seen that worked even harder than Gilmour. Even though Gimour was only here for what, parts of 5 seasons or so, he engendered a passion you don’t see often- even in hockey-mad Toronto. To this day, if you say “Dougie”, everyone around Toronto knows what you mean. So, he’s number1. For me, Keon remains the finest all-around Maple Leaf I’ve ever seen because he consistently did so many things well for so many seasons. For 15 years he did just about everything a player can do. He checked the best centers on the other team, killed penalties, put up points, rarely ever took even a minor penalty himself (thus saving his team and teammates in the process), and in his later years, made marginal wingers better than that. Still, despite helping the team win those 4 Cups in the 1960s, some Leaf faithful became agitated with Keon because of his supposed “stubborn” (I don’t see it that way, as I’ve posted here before…) refusal to make peace with the organization since he was shoved out of town by then-owner Harold Ballard in the summer of 1975. But unless you were alive in the early ‘60s—before all-sports radio, round-the-clock sports coverage, social media, Twitter and everything else—you can’t understand how popular “Davey” Keon was. He was our answer to Montreal’s Henri Richard and more often than not was a Hab-killer—which made we Leaf fans of that generation love him all the more. One of the fastest (and smallest) NHL players of his era when he arrived on the scene in the fall of 1960, he was, in my mind, one of the best all-around players in hockey in his first half-dozen years in the league, between 1961 and 1967. He was still a wonderful player into the ‘70s, having some renaiscance years with the Leafs, especially in 1970-’71 and 1972-’73. If you heard, as I did, Leaf fans in Maple Leaf Gardens shout “we want Davey” after he was already in the dressing room after the Leafs beat Detroit for the Cup in Game 5 in the spring of ’63 (he came back out onto the ice to take a bow...it was amazing to see), you know how popular he was in those early days. So, he’s second on my list. Sittler’s career was so much more than that 10-point night against the Burins in the mid ‘70s, though that is often what he is best remembered for in a Leaf uniform. In fact, for me, I was impressed from the get-go with the way he earned his time with the club after being a first-round draft pick in the summer of 1970. He overcome a serious injury in his rookie season, played the wing and went on to become team captain - and a true team leader - before the 1975-’76 season. In fact, I was even more impressed when, at the press conference introducing him as captain, he slammed owner Harold Ballard for the way he treated Normie Ullman and Dave Keon, after the Leaf owner had run both respected veterans out of town. In the mid and later-‘70s, there was not, at least that I recall, a more popular Leaf than Sittler. How well-known was he? The popular Canadian comedy team of “Wayne & Shuster” invoked Darryl’s name in a comedy skit on one of their TV specials, During the bit (about kids in their neighbourhood many years before) they wondered something along the lines of “whatever became of that little Darryl Sittler anyway…”. It drew a huge laugh because Sittler was one of the most popular guys in the country, especially after scoring an huge goal to help Canada win the first-ever Canada Cup in 1976. That he, too (like Keon before him), was treated shabbily in the end by management (Imlach, who had returned as General Manager of the Maple Leafs for a second time) and ownership (Ballard, of course) did not diminish his legend. He certainly deserves to be at least number 3 on this list. It’s hard to describe just how excited Leaf fans were during the 1960-’61 season when Frank Mahovlich was on fire and looked certain to break Rocket Richard’s single-season mark of 50 goals in a season. Imagine if Phil Kessel was somehow "on pace" to break Wayne Gretzky's single-season record of 92 goals or whatever that remarkable total was years ago? How on fire would Leafland be nowadays? Mahovlich never came close to duplicating that feat with Toronto (tough he later did with the Red Wings) but he certainly helped the Leafs in terms of their Cup success in the ‘60s. His long-striding, swooping solo rushes were a thing of beauty, and while he was sometimes booed in Toronto (he was the classic hockey enigma, the superstar who made things look easy, but also appeared lazy when things weren’t going so well), he was still an immensely popular Maple Leaf. I’m guessing there aren’t many Leaf fans who don’t remember where they were when Mahovlich was traded to Detroit before the end of the 1967-’68 NHL season. Now still in the Canadian Senate, if I’m not mistaken, Mahovlich was one of the great Leafs of all-time. While he was sometimes maybe misunderstood and under-appreciated, to me, he is on the list. 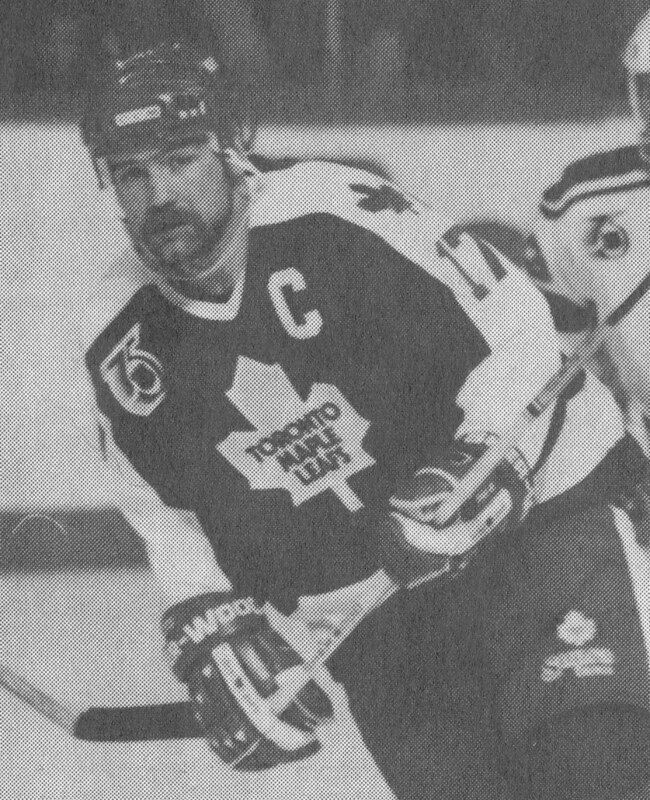 While it did not quite compare with Wayne Gretzky being traded away by the Oilers, Wendel Clark being dealt to the Nordiques after two consecutive trips to the “final-four” on behalf of the blue and white was a tear-filled day for a lot of Leaf fans. 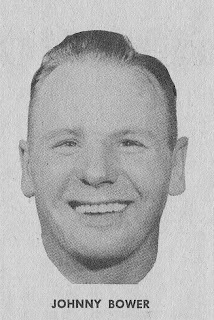 While Clark’s commitment had been challenged somewhat by an impatient Harold Ballard (and even many Leaf fans) during some of his lengthy injury-related absences, he was nonetheless a well and deeply-loved Maple Leaf throughout his three separate tenures with the franchise. He had that wicked shot, hammered guys all over the ice, and of course would tangle with anyone, though he was not really a huge guy. 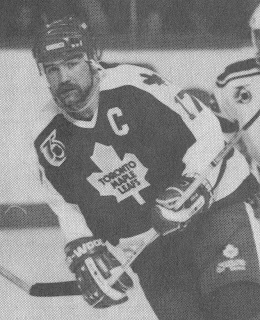 The most memorable Wendel moment was no doubt his Game 6 hat-trick in the 1993 semi-finals against the Kings (if not that, perhaps his toe-to-toe scrap earlier in the series with Marty McSorley, while “protecting” Gilmour). A lot of us thought when Game 6 was in overtime that we just might get to the finals that year against Montreal. History reminds us that we didn't. But Clark did everything he could to get us there. The fact that Clark is still connected with the Leafs and does commercials as a spokesperson for a number of companies and causes speaks to his everlasting popularity. All this said, to me, the most revered and beloved Leaf of my lifetime has to have been (and still is) Johnny Bower. There are so many aspects to his life and hockey story that are charming. That he always lied about his age, for starters. That he did not make the NHL until later in life, and was not an established NHL’er in his mid-30s. Imlach worked him harder and harder as Bower aged. Johnny always came across like the guy-next-door. He was a huge part of all those 1960s championships. He played without a mask (imagine facing Bobby Orr and Bobby and Dennis Hull without a mask) until his last ever NHL game, which was during the 1969-’70 season. Upon retirement, he was always part of the organization in some fashion—as a scout for the team for years and a sometimes goalie coach. To this day, now in his late 80s, he will evidently gladly be part of the upcoming Winter Classic in Michigan in January. He remains the same down-to-earth man he was as a hero to Leaf fans in the ‘60s. He is accessible, still quotable, and still every inch the living legend. And still the most revered Leaf in my lifetime. I recognize that there are all kinds of other names that could be on this list of "most popular" Maple Leafs. Long-time Leaf captain George Armstrong (who might be on the list if he did not avoid any and all personal publicity; he was such a highly-regarded individual), for example. Yet because he is indeed so reclusive people don’t get to see him often, unlike Bower, and he tends to be forgotten just a bit in Leaf lore. Then there is Tim Horton and Eddie Shack. Paul Henderson, given his Team Canada fame while he was with the Leafs. Lanny McDonald. Mike Palmateer. Curtis Joseph. And of course, in more recent times, Mats Sundin. I guess right now, I’d say James Reimer just might be the most popular Leaf—especially if he returns healthy and plays as he did in his rookie season. The combination of being a Leaf goalie and a genuinely nice-seeming young person makes him a well-liked Maple Leaf, for sure. Maybe it’s Phil Kessel, but he still seems to have the Mahovlich-like lightning-rod aspect to his game, but without the Big M's 4 Cups. While this is not a debate, I feel pretty comfortable naming the five I mentioned today. But as I said above, fire away—I look forward to hearing from you! I'm glad you put Doug Gilmour in there. I lived just south of Calgary in Gilmour's years with the Flames. Dougie was a terrific player with Calgary but he never seemed to get the national notoriety. Then he got traded to the Leafs and all of a sudden he was among the best two-way players in the world...duh! Dougie Gilmour a heck of good two-way player who finally got his due...even though he had already powered a team to the Stanley Cup. Back in his Calgary days I used to think this guy has to be top 10 or five in the league but they don't really talk about him like that....then the change. I keep thinking that Grabovski is going to turn into a mini Gilmour. Someday, the Leafs are going to get into the playoffs and Grabbo is going to check and shutdown the the top line of the other team while scoring a bunch of clutch goals, just like Dougie. It will be that Chara game for a whole series. And we are all going to say...he's a really good player...duh! I predict 10 years from now that Grabbo might have place on the mantle of Vintage Leaf Memories for a good playoff run. Three cheers...to that hallowed day. You had a birds-eye view of the then future Leaf, DP, and you were one of those who could spot a player. And Gilmour was certainly that. He was important to the Flames and vital to the nice runs the Leafs had in '93 and '94. Grabbo? Hey, that would be great. Let's have this chat, as you mention, in 10 years! Right now? wow that's a hard one. Grabovski is popular with the online crowd now, but overall i think his quirkiness is missed by many. Kessel is awesome but "HE'S 'MERCAN! AND BAD AT DEFENSE!" dominates the conversation about him in general. I would think it'd be Phaneuf but the media makes him out to be terrible so many follow suit. Right now...i can't say anyone jumps to mind as being near any of the above (or, barf, Domi) in popularity. now my top 3 would be Grabbo, Kessel, Lupul for a combination of on ice (kessel says YAAAAAAAY)and off (Grabbo interviews, Lupul tweet taunts). ahhh, as a kid, felix potvin was my favorite... very talented goalie who was developed in the leafs system no less! loved his style in the crease, and i loved his mask! I definitely can't argue with your list Michael. I'm a little young to have seen the Big M or Keon as Leafs for any great stretch, but the other 3 are tops in my list. There's a number of the 'tough guys' who rank highly. Granted, they aren't always the most skilled, but Domi, Tiger, Maloney, and now a guy like Mike Brown, often they're admired for the work ethic and the 'role'. And, I would add some love for some guys who toiled during the dark decade of the 1980s. Guys like John Anderson, Billy Derlago, Eddie Olcyzk, Vin Damphousse. I think looking back now I realize these were some really skilled guys, maybe not the cream of the crop (considering they played in the Gretzky and Lemieux era), but I have to admire guys who could routinely score 30-40 goals. Thanks elseldo. I agree that, right now, it's hard to put any of the current Leafs in the category (or even near) those I listed in the post today. If the team improves noticeably and some of those you mentioned continue on a positive career trajectory, we can re-assess down the road. I didn't include Potvin in my "honourable mentions" list, Alex C., but I should have. He was a backbone player on those '93 and '94 teams. He just quietly did his job. For sure, Mark. Toronto fans love their fighters/tough guys, for sure (Domi, Tiger Williams, etc.). I think we appreciate any players who work their butts off. I'm glad you mentioned some of the '80s guys. While that was a largely frustrating decade for Leaf followers, there were definitely some players who deserve "love", as you put it. Good stuff as always. Thanks Mark. Maybe that is the problem with the Leafs, since Sundin they have not had a "face of the franchise". Which is a little disturbing. With all due respect, Phaneuf does not belong in the group mentioned above. I love Grabovski but he is not that guy right now. Sittler, Gilmour, Clark, those guys would go right through you to win. Keon and Mahovolich were awesome. Perhaps this is what this team needs, an Yzerman, Roberts, Gilmour, Sittler type of guy that makes everyone around him a little bit better. Wonderful idea for an article, Michael. My recollections go back to the late 40's. If you will indulge me I would like to list favorites by decade and list a top 5 as a conclusion. Note: The number in parenthesis is the number of Stanley Cups won with the Leafs. Sorry to be so long winded but there are so many Leaf players that I liked over the years that it was very difficult to whittle the list down. As I'm sure you can tell, I have a special affinity for the group of champions in the 60's. All time favourite Leaf was absolutely Wendel Clark. Could skate, hit and score. He would stick up for himself and for his team-mates. I was a Gilmour fan as well. The only thing about him that I didn't like was Dougie. We seem to have both ends of the spectrum in hockey in the same player in Gilmour. People either called him Killer or Dougie. One was a great nickname, the other, well sounded infantile. In related Leaf news today. The blustery one known as Burke, is stating that the team that he has assembled right now is ostensibly the one that he will be opening the season with. Quite the change from the talk of absolutely no way this is the team I will start the season with a few short weeks/months ago. On an unrelated topic. I am having trouble trading my accumulated pocket lint, some old buttons and a paper clip for a new car. It is the car dealers fault that they will not take my castoffs and rejects for something that is clearly of value. Burke is only slightly more difficult to pin down on a direction than a three card monte dealer. These guys still exist, right? I don't get out much anymore. On the money, Brad (cbh747). I like your inclusion of Gary Roberts. Though he was only here a short time, he is precisely the kind of guy who would be "beloved" in Leaf lore had he played here longer. You know I thoroughly enjoy your posts here, Pete Cam. What a wonderful list of names. I particularly like that you included Tod Sloan (did he not go on to win a Cup with the Hawks in '61 before he retired?). Salming is another excellent inclusion. I'd throw Todd Gill in there for the '80s/'90s. While he was sometimes maligned here, he gave his heart and soul and wore the Leaf jersey proudly. I think a lot of us respected that. Not surprised Teeter Kennedy is on your list. Loved that post today, Jim. Wendel certainly inspired a generation of Leaf fans for all the reasons you mention. As for Burke's latest statement, well, should we be surprised by his (yet again) change in direction? It has been a constant since Day One. You are correct. Tod Sloan did win a cup with Chicago in 1960-61. That was his last year in the NHL. I did consider Todd Gill and should have included him. I always liked him as a player, especially his grit and desire. Sadly, I am not surprised by his change in direction. There have been so many, I frankly feel lost. I have no idea how a team that finished 14th in the conference and will make very few changes to the lineup, can be taken seriously at this point. That goes for Burke as well. Other teams make moves, ours talks about how hard it is to do so. If Burke is uncomfortable being in charge of one of the biggest money making franchises in sports, why did he come here? If he wanted to show fiscal restraint and his business acumen, why not go to one of the weak sisters of the League? Tune in next week folks, I am certain that Burke will be working on a giant trade for a No. 1 centre and a top flight goaltender. He will probably try to trade Reimer in the process. Speaking of nicknames today, how about Brian 'The Used Car Salesman' Burke? It has a ring to it. There are still a lot of Leaf fans who believe Burke is doing a good job, Jim. I'm not really in that camp, but I understand that people want to believe in someone. They point to his Cup in Anaheim and his "success" in Vancouver. To me, as I've said before, his two major re-build efforts in Vancouver in Toronto have, so far, netted one playoff series win in 11 seasons. Is that good enough? I'll have more on his recent comments soon...but mostly I will want to hear from other Leaf followers. I agree wholereartedly with Jim on Burke's monetary machinations. I cannot help but feel that he is positioning himself for the commissioners job and is playing the good guy who doesn't offend the other franchises. Hard to say who my favourite all-team Leaf would be. I think I'd have to give the edge to Sundin over Gilmour just because of his longevity with the Leafs and his character on and off the ice. Lots of great names mentioned in your post Michael as well as by many of the previous comments. One name which I didn't see was Ron Ellis. He had to fight so many obstacles in his career, not the least was clinical depression. Another guy who needs more prominent mention is Red Kelly. He was a class player. Had his name engraved on the Stanley Cup 8 times! He is a HHOF member and a member of the Order of Canada. He was a Liberal member of Parliament from 1962-65, while he was still playing with the Maple Leafs no less. Ironically he beat out Alan Eagleson as his Conservative opponent in 1963. Kelly put in quite a number of years as a coach, and coached the Leafs from 1973-1977. Heck he even got the players to believe in "Pyramid" power and inspired them to play some of their best hockey. Quiet, yet witty guy who is still a very proud Maple Leaf alumni. I seem to recall, Pete Cam, that you (or someone has!) made this very point before about Burke and the Commissioner's position. Interesting. That's one of the fun things about these discussions, Don (TML_fan), we all have our own memories and views. Sundin certainly deserves recognition. I wholeheartedly agree about Ronnie Ellis. He was probably under-appreciated in a long and excellent Leaf career. You've well made thew case for Red Kelly- including "pyramid power". How many players have 8 Cups on their resume? He was such an important Leaf in the 1960s. Great post. Great names. Thanks Don. And that alone should make Red a hero in Leafland, Don! Great read today. Can I add Syl Apps to the list as he was a much revered player and captain for the Leafs in the 40's. I didn't get to see him play but I sure read a lot about him when I was young. My personal favorite was Sid Smith in those days because of his scoring ability on a line with Kennedy and Sloan. Other names from the past that I understand were household names in Toronto would be Charlie Conacher and Busher Jackson Of course, I can't imagine leaving King Clancy off the list. I gather he had a great playing career and, even if he did hang around with Ballard in later years, he was still well liked for his contributions over the years. Thanks Ed. You've added some illustrious names, for sure. I was focused on those players in my own lifetime, but I'm glad you have mentioned some truly memorable Leaf greats like Conacher and Clancy. Didn't Sid Smith go on to help the Whitby Dunlops win the World Championships in 1958? Thanks for chiming in on this one, Ed. You have seen so many of those wonderful Leafs and it's always good to hear from you. Interestingly enough my wife's uncle was also a member of the Whitby Dunlops when they beat the Russians for the World Championship in 1958. Yes Michael, Sid did play for them at the worlds that year. Mark Ascione wrote a nice piece about him and his career recently in his series on former Leaf captains. I don't have a link but maybe Mark could add it. He is not a well known captain since he didn't fare very well in the job. Probably was a lot like Kessel in temperament I guess. Mark is an excellent writer- his pieces are always first-rate. I was too young (born in '53) to really remember Sid Smith's short tenure as Leaf captain, but I do know he was an important contributor in his time in Toronto. Thanks for confirming the Whitby connection, Ed. Thanks for the trip down the best of memory lane! Though my 'sentience' (love your terminology) began in '68, I believe it took a couple years before my leafs-mania was 'full-blown.' Therefore, my timeframe differs by a brief Bower and a full Mahovlich, though I would be remiss to ignore my father's oft-spoken lament at the latter's departure from the fold. 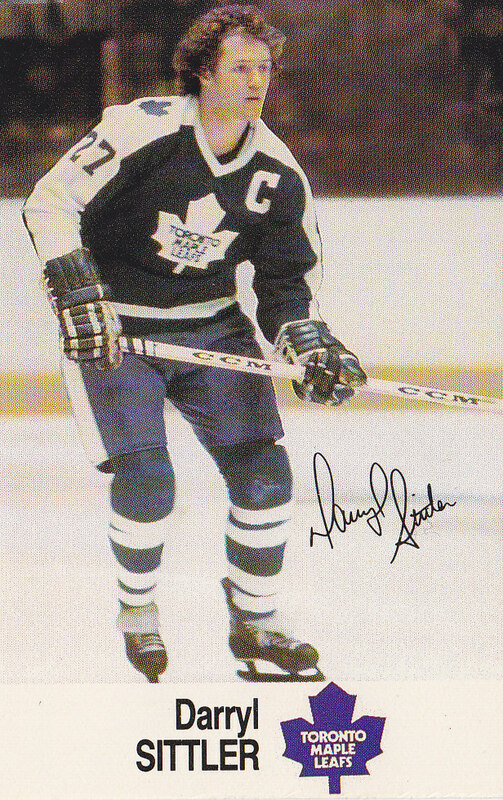 1) Darryl Sittler - my most passionate years were enhanced by the talent, grit and leadership of my all-time favourite Leaf. 2) Davey Keon - a close second, but only because I missed so many of the early years. Always remember his dancing skates, straight stick blade and amazing backhand shot. 3) Dougie Gilmour - the intensity of his time with the Leafs, lengthens the perception thereof! 4) Wendel Clark - the memory of time lost to injuries, because of his 'heart on the sleeve' exploits for which we love him, and the disappointment over 'what we missed' while he was recovering, probably has a lot to do with this ranking not being higher. 5) Torn between Mike Palmateer and CUJO - I always loved the position they played and appreciated the hope their presence brought in both eras. Just off the list is Sundin, because it took some time getting over the loss of Clark while we waited for him to mature into the guy who could carry the team on his back. Perhaps this is a word of caution for us to allow players to develop fully (instead of lamenting what they are not.... yet). BTW, PeteCam may well have mentioned the possibility of Burke as Commissioner at some point, too, but you may have also been remembering something I said at the beginning of July, "I also feel that BB has aspirations to replace Gary Bettman (whenever he retires from his position at the top). It would be unlikely that BB could garner that role, unless he proves himself to remain true to the direction that the NHL intends to pursue." ...just in case you were wracking your brain to remember... we can't allow any damage to your Vintage Leaf Memories over some Brian Burke reference! I'm glad you included Cujo and Palmateer on your list, InTimeFor62. Both brought hope, as you said, at important times and when the franchise really needed exactly that. I knew somebody had raised that possibility InTimeFor62- let's give "shared credit" to you and Pete Cam! Dad always showed great admiration for the Big M, even when he played for the Habs (and the 72 Summit Series), but it was also quite evident, in retrospect, that it was like watching Clark play for anyone but the Leafs! Too bad we never got to see Frank return to the Leafs for an encore, like Wendel! I wonder if Pete Cam and I would be able to 'share' in the 'credit' of a finder's fee when Burke takes on that $8M (plus??) position in the future. And (in the spirit of a win-win VLM CBA) I propose a 50% share be provided to the owner of the site who allowed us to play here and made our amazing fee possible. I'm just happy to be here doing what I love (for a reasonable fee - if ever my amateur status could be overcome)! I wonder what head-hunters' fees are nowadays, InTimeFor62? You provided my smile for the day- thanks!